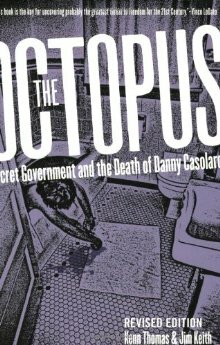 Writer Danny Casolaro was on the trail of the Octopus when he was found dead in a West Virginia hotel in 1991, becoming part of the most extraordinary political tale of the ’90s. The slashes in his wrists were too deep to be self-inflicted. The accordion file with his recent research was missing. He had told his family to be gravely suspicious if an accident befell him. Casolaro had been suicided. Today, Casolaro’s “Octopus” – a transnational power bloc pursuing its own interests through subversion and overthrow of governments, dirty money and extra-electoral manipulation – has risen again. The players Casolaro identified in his research, including Iran-Contra spooks, Middle Eastern weapons merchants, double-dealling politicos, and terrorists, have reappeared. The story begins with October Surprise, a trading-with-the-enemy scheme that set the stage for America’s quagmire in the Middle East. The tentacles of The Octopus attach themselves to the Inslaw affair, the theft of super-surveillance software used to spy on criminals and police alike. The grisly saga continues with Osama bin Laden and Saddam Hussein, both believed to be evading capture through the use of Inslaw’s PROMIS software. What survived of Casolaro’s research fell into the hands of two writers, Kenn Thomas and Jim Keith. In 1996 the hardcover edition of The Octopus was released. In 1999, co-author Keith died, like Casolaro, under mysterious circumstances. This revised and updated edition, which continues Casolaro’s (and Keith’s) research with new chapters on Octopus involvements with the events of 9/11, may be the most comprehensive investigation into the tangle of international conspiracy.